I’ll be in Paris this week if anyone is nearby. Part 2 of Taking My Time, a mini retrospective of sorts, will open the evening of January 12, and I’ll be there to say hello. This entry was posted in Uncategorized on January 10, 2017 by joelmeyerowitz2014. All the celebrations are now over and reality makes its way back wherever we look, and looking is what we always return to to ground ourselves. Looking at our daily life, our family (just as crazy as everyone else) our politics, and politicians (what a ride we’re in for) our work, our street, or city, everything that’s right there in front of us. All of it fresh once again for thought and eye. 2017 has just begun. Make the most of what you have, and whatever it is that comes your way. This entry was posted in Uncategorized on January 1, 2017 by joelmeyerowitz2014. During the last six months of silence I’ve missed the daily contact with all of you, and the ‘stretch’ it required of myself and my thoughts about life and photography. But, in a way, last year’s blog was preparation for the book I wanted to write for children about “seeing things”, both in photographs and in the world around them. 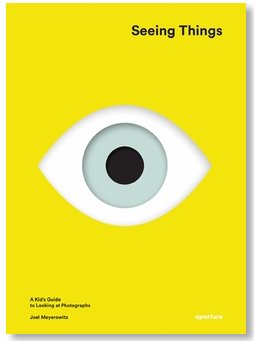 That book, published by Aperture; is called “Seeing Things,” and is just now being delivered to bookstores everywhere. I wanted you to know about it first. You might want to see how writing for you prepared me for finding a voice that was adjusted to the range of kid’s interests, but did not talk down to them. This entry was posted in Uncategorized on July 23, 2016 by joelmeyerowitz2014. We have done it again! Another trip around the solar system on this wondrous planet of ours. And it was a year – speaking for myself, or course – full of momentary wonders, large and small, cheerful and sad, sunlit and shadowed, and basically filled with every kind of contrasting possibility, which is what life seems to offer us every single day. I spent the morning here reviewing every photograph in the blog and was surprised at both the range and diversity of the images, and I could also see how many themes and sub themes there were, and how regularly they came into play. The truth is I have my limits, and even though I am trying to reach beyond what I know how to see, I still can’t get away from myself completely, not that I thought I could, or would even want to be completely other, but this year-long experiment was meant to shake the joints of this old mindset loose through the ordinary practice of daily seeing and responding. To that end I feel gratified that even though I was stretching things thin a bit by working that way there are still enough high points along the line that I can go back in now and see what stands out for me. If I were to find say, 50 to 75 images out of 365, that held together, or pointed me in a new way, that would be worth the effort. Although the effort itself was what was truly worth the effort. And then there is the patience and support that all of you so generously offered me. Your feedback, and your willingness to climb aboard and play this out with me is an unforgettable part of this year’s journey. It was somewhat like having a virtual crew on board our spaceship as we journeyed around the sun together. Your company made it special. My hope is that by sharing this adventure in seeing with you, and trying to write about it, that something of the special nature of photographic language will have been opened up for all to use as each of you can. Not that I have anything so special to add to the discourse, but because I believe that images offer up speculation after the fact, and that speculative stimulus sends us deeper into the mysteries of the medium, and once we are inside we can begin to find our own way forward. I like that; the invitation into the mystery. Because isn’t that what life is? This is the last post of 2015. I will not be making daily posts from this point on, there is just too much I want to do, and the time seems to be getting shorter in these later years, and so I want to make the most of what I have, especially now that I have some freedom thanks to the sale of my archive. But I will continue to post my thoughts and/or questions whenever something comes up that seems worthy of sharing with you, or mulling over in public. So, stay tuned. I will miss the dialogue that I have had with some of you, but the blog remains ‘live,’ and it’s there for whoever wants to make something out of it, or reconsider some of the issues touched upon in the course of our journey. use it as you wish. I salute you all and wish you the spaciousness of another year. 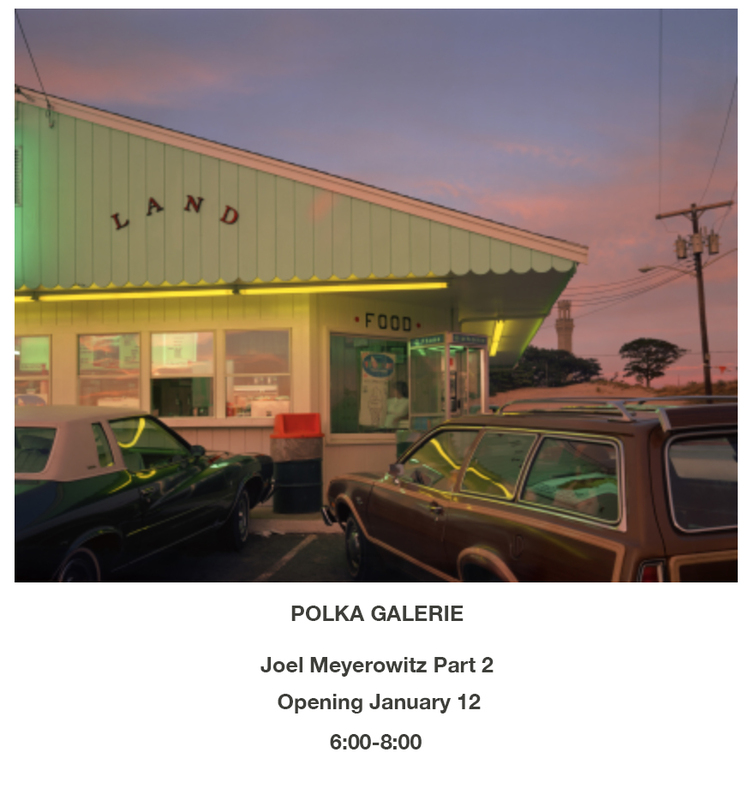 This entry was posted in Uncategorized and tagged The Last Blog Post on December 31, 2015 by joelmeyerowitz2014. When it comes right down to it we can only work with what we connect with on any given day. It depends on where we were, what our appetite for seeing was, what the coincidences of the day threw across our path, or finally, what we were alive to at any one moment. As I sat there for a moment thoughts of Dubuffet and Art Brut came to mind, and Philip Guston too, one of my favorite painters who never flinched at hard, ugly realities, and found ways to address them in his paintings, ways that challenged the values of the art world at that time. And so the longer I stayed in that moment’s reverie with this scrawny, bristling and blighted image, the more I realized that it was the most exciting thing I had see all day, and in fact was beautiful in its own demanding and difficult way. 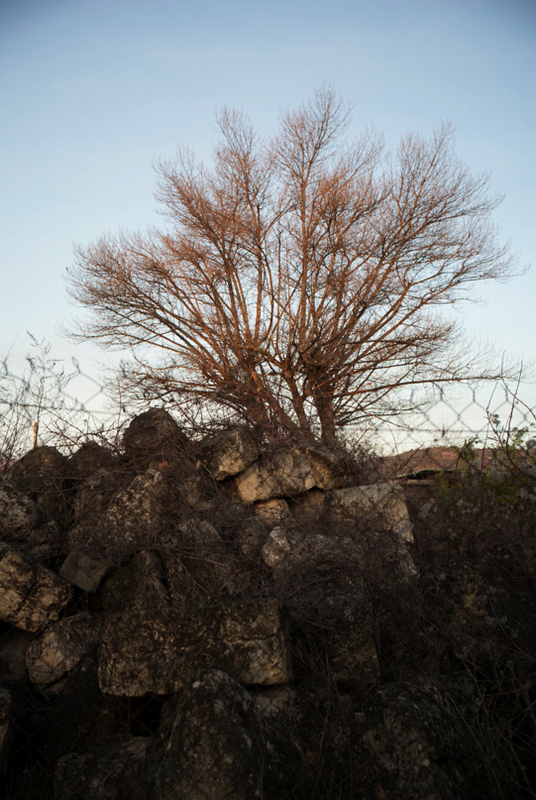 This entry was posted in Beauty and the Beast, Trees and tagged Landscape, Provence, stones, Trees on December 30, 2015 by joelmeyerowitz2014. 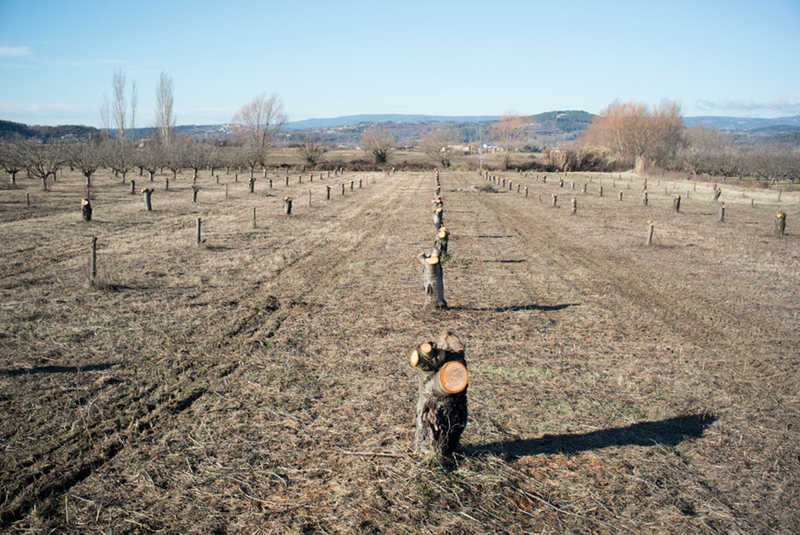 It has always amazed me to see how ruthlessly orchard growers purge their fields once the trees have stopped producing as they had in previous years. Even when the trees seem fairly young as these do. But this kind of husbandry is wise and farsighted. They know what the land can do, and what changes it needs to continue to be fruitful. In their practice I can see my own pruning methods as I have edited my work over the years. I used to call it the ‘sticky finger’ approach. That is; whenever I paged through stacks of prints (back in the 60’s and 70’s and 80’s I printed like crazy – thus my 50,000 prints that I recently went to New York to sign for the sale of the archive) and so while reviewing prints, whenever I came across a photograph which, for whatever reason, refused to go quietly into the ‘Out’ pile, although sometimes it did so on a first cut, but then, somehow, it worked its way back into the mix of the ‘In’ pile, because each time I saw it, it ‘stuck to my fingers,’ as if it was telling me, wait a minute, you don’t get me yet, there is something here beyond your understanding at this time. So I held on to those quirky images until either I caught up to what they were saying, or, by pinning them to the wall over my desk so as to catch my roving eye while speaking on the phone, or while daydreaming, I finally got their message. Whatever the case, hard cutting is necessary for future growth, be it an orchard or a body of work. 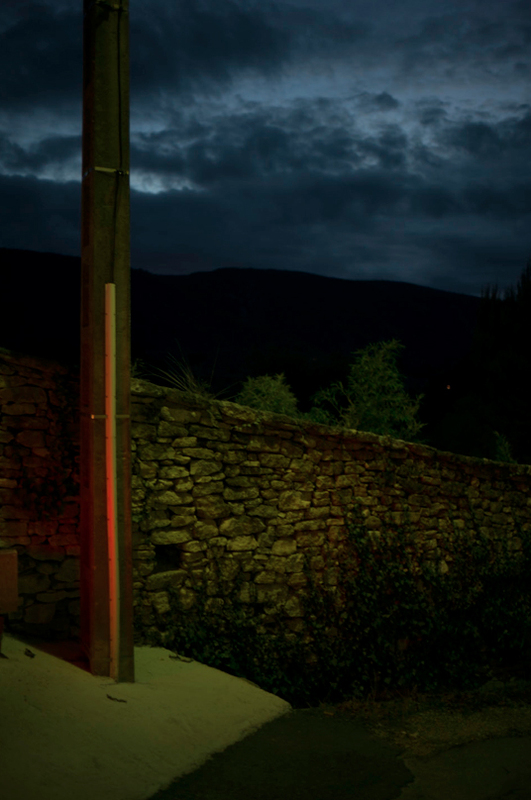 This entry was posted in Landscape, Nature and Culture, Provence, Season and tagged Bonnieux, Landscape, Trees on December 29, 2015 by joelmeyerowitz2014. 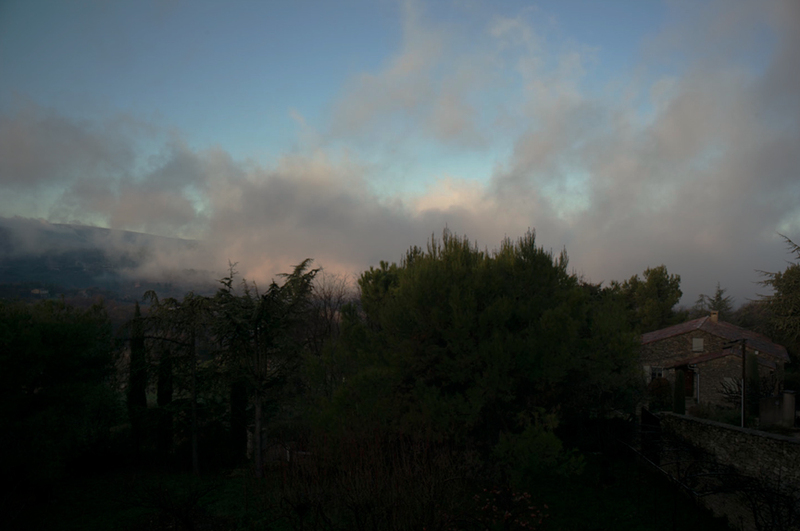 The sky was in the valley. A dust and pink extravaganza with a glow in the center that felt as if cumulus clouds had slumbered there like giants in their piney beds. 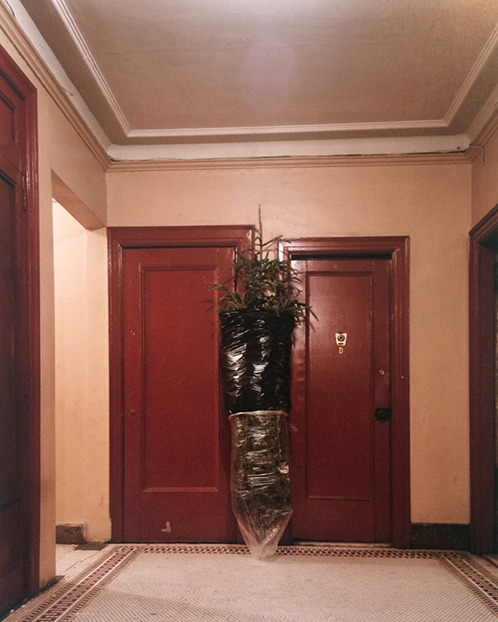 This entry was posted in Clouds and tagged Bonnieux, Landscape, Trees on December 28, 2015 by joelmeyerowitz2014.